Thanks to Dermot McEvoy for sharing the song, and for pointing out that the group took their name from lead singer and songwriter Thomas Earl Jameson, who shared his surname with a popular Irish whiskey. Dermot concluded: "If this song doesn't make you smile you are beyond help." A new homonym peeve: "throes" vs. "throws." I suppose one could be said to be "in the throws" if one is on the mound, like Mike Pelfrey in the photo above, or addressing the Porcelain God after the ingestion of too much tequila. What the bidders for LICH were in were the throes, meaning "a hard or painful struggle". One could be both in the throws and the throes: certainly in the tequila example; also in the baseball example when, say, the game is close, there are no outs and runners in scoring position, and the count is against you. In the matter of the LICH negotiations, though, it's got to be the throes, at least unless you accept the argument that SUNY threw victory to Fortis. I'm hoping this isn't Ms Strickland's unforced error; she has a good record. Rather, I suspect it's the fault of a spell check program (as Twif suggested in response to my earlier diatribe against rein/reign confusion) that wasn't fed enough vocabulary to recognize "throes." That, or a really dumb copy editor. 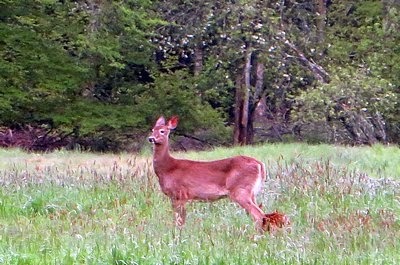 Early on the first morning of our Memorial Day weekend visit to the Beaverkill Valley I spotted this white-tailed deer (Odocoileus virginianus) doe and fawn on the meadow behind the house. 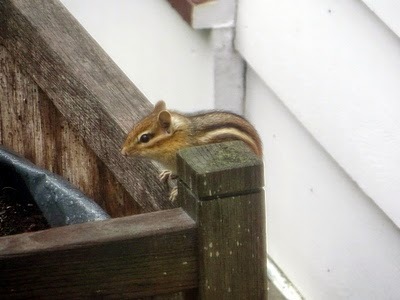 As we were having breakfast, this eastern chipmunk (Tamias striatus) peeked over the back of a bench on the patio. That evening I looked out a window and saw what may have been the same doe and fawn I had seen in the morning, in a meadow between the house and the road. I went out to the porch and took this photo. I tried to be as quiet and unobtrusive as possible (I was using my 20X zoom at almost full power) but, as you can see, the doe spotted me. A few seconds after I took the photo, she bolted for nearby forest cover. 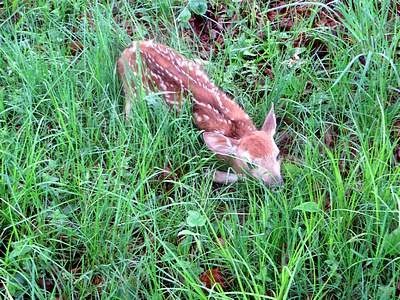 I walked softly out to near where the deer had been, and saw the fawn cowering in the cover of the tall grass. 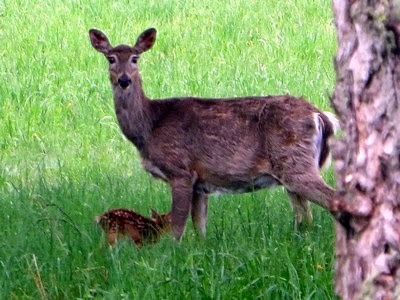 The following morning the fawn was gone; evidently the doe came to retrieve it under cover of darkness. 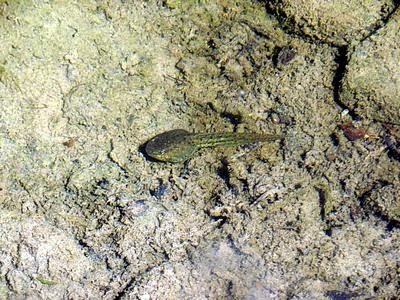 Walking around the pond behind the house, I noticed frequent small splashes at the water's edge as I approached. 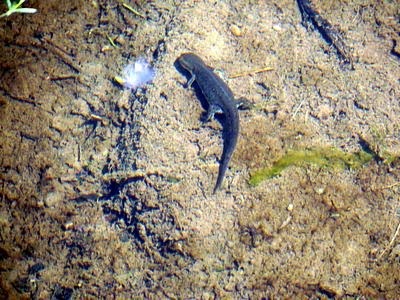 Looking into the pond, I saw what I've tentatively identified as a northern dusky salamander (Desmognathus fuscus). 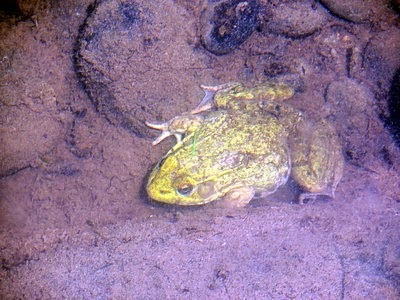 Finally, I spotted a full-grown frog, probably either a bullfrog (Rana catesbeiana) or green frog (Rana clamitans). For birds, see my earlier post, "Birds of the Beaverkill". Bloomsday bonus: John Huston's The Dead. 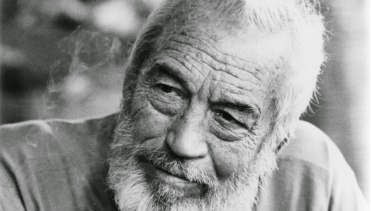 The Dead, based on James Joyce's concluding story in his anthology of early writings, Dubliners, was John Huston's last film. Huston's son, Tony, adapted it for the screen with advice from his father. The clip below shows the film's conclusion. Gabriel Conroy (Donal McCann) and his wife Gretta (Anjelica Huston) have returned from a party at which Gabriel learned that Gretta had a lover, Michael Furey, who died before Gabriel met her. The scene takes place in their bedroom. Gretta has collapsed on the bed, and sobs. When she falls asleep, Gabriel looks out the window as snow begins falling and muses on mortality; both Furey's and his. What reminded me of the film The Dead, which I saw many years ago, was an e-mail from Patricia Harty responding to Dermot McEvoy's earlier e-mail that inspired my previous post. She provided a link to a piece from Irish America that includes an interview with Huston during the making of the film in 1987. Ms Harty also provided a link to a sound recording of Fionnula Flanagan reading "Counterparts," another story from Dubliners. Hear it here. 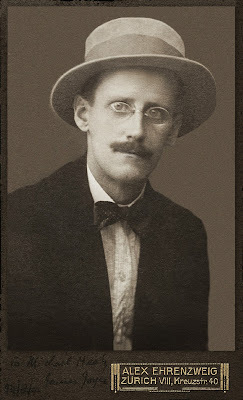 June 16 is called Bloomsday because it is the date on which James Joyce's Ulysses was set. The novel follows the actions and encounters of its protagonist, Leopold Bloom, on June 16, 1904. Today it is celebrated in Dublin, where the action in Ulysses takes place, as well as in New York and other cities. Thanks to Dermot McEvoy, in whose historical novel The Thirteenth Apostle I am now engrossed, who has provided me (and the rest of the alumni of Lion's Head University) with the above video of "River Liffey," the concluding number from Jonathan Brielle's musical Himself and Nora, "Himself" being Joyce and "Nora" being Nora Barnacle, his wife, with whom he had his first date on June 16, 1904.